Barrel: Machined from 416R stainless steel, chambered in .308 WIN with a 1:10 twist rate and a midlength gas system. 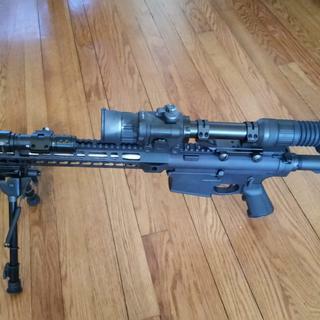 Upper is paired with a PSA 15" Lightweight M-Lok free float rail, .750 gas block, and an A2-style muzzle device. Lower: Precision machined from forged 7075-T6 aluminum, these lowers are then Black anodize hardcoated to MIL-8625 Type 3 class 2. With an AR-15 style fire control group, a Magpul ACS-L Stock, and a PSA Overmolded A2 Grip. This is an ideal platform for the 308 cartridge. What is the over all length of this rifle with the stock in the shortest position? How long is the complete gun? I've always been a believer in only shooting what's stamped on the barrel. What magazine does the PA-10 use? BEST ANSWER: Any of the Magpul AR-10 Magazines. MAGPUL PMAG 25LR/SR GEN M3 WINDOW, 7.62X51 MAGAZINE MAG292-BLK. This is what I use. It comes with the 20 round PMAG version without the window LR/SR. Hope this helps. How far effective range with 18” barrel? BEST ANSWER: With the right shooter and optic you could push it out to 1000 yards but 600-800 yards is more practical. At least 700 yards....usually farther than most can hit a target! What type of threads does the end of the barrel have? sights ..front back..whats is available? What makes it a lightweight in comparison? The 18” is considered a mid-length rifle, so it’s a-little lighter than a full-length rifle (20” or longer). Is the barrel threaded for a silencer ? BEST ANSWER: The rifle is treaded for the attached muzzle break, if unscrewed a suppressor could be used. What sort of charging handle is this? PSA ambidextrous? BEST ANSWER: If your referring to working its great, its works for right or left handed people. good deal. What kind of accuracy is guaranteed with match ammo? Can this rifle be shipped to California, or modified for California? I purchased on of these and it sat in the closet, while I played with other customized DPMS LR-308 platforms. The first time I took it to the range I had fail to feed & fail to fire issues. I contacted PSA and they sent a prepaid label, repaired the weapon and returned it to me with absolutely no out of pocket expense. Second time out at the range, the weapon ran flawlessly. Groups were in the 1-1.5 MOA range sighting in a Sightmark Photon night vision scope that only has .5 MOA adjustments. Performance was outstanding... PSA stood by their product. Well pleased with this purchase. Great rifle for the price, can't build one this good for less. I love this rifle. It had become my goto hog and deer rifle. Paired with Vortex Hog scope. Deadly combo.